A charred body has been recovered from a car which was found burning in a field near a remote village. 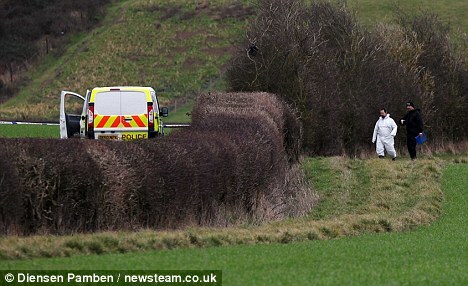 Police investigating the grim discovery near the small village of Aston Cantlow, near Alcester, Warwickshire, responded after villagers saw smoking rising up from the field. Officers have yet to establish whether the body was male or female, while the car itself was turned silver and ‘completely destroyed’ by the blaze. The car, thought to have been red or dark burgundy Peugeot 306, was found early on Wednesday morning around 150 yards up a dirt track leading off the main road in Aston Cantlow. The death is currently being treated as unexplained, a Warwickshire Police spokesman said. 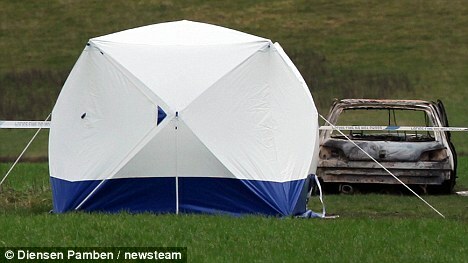 This afternoon a forensic tent had been erected next to the wreck as scene of crime investigators assessed the scene near the sleepy village. One female resident, who did not wish to be named , said she had seen two police helicopters flying over the village this afternoon. She said: ‘There seems to be a lot of police activity up there. ‘If it’s just a suicide like some people have said it makes me wonder why they’ve sent so many police officers up here. ‘It’s not a public road, the farmer who owns that land drives up there to feed the pheasants, it’s just a dirt track really. A spokesperson for Warwickshire Police said officers and fire crews were called to the scene at around 7.30am. The spokesperson said: ‘Investigations into how the car came to be on fire in the field are at an early stage, and police would like to hear from anyone who has any information about the car and how it came to be where it is.